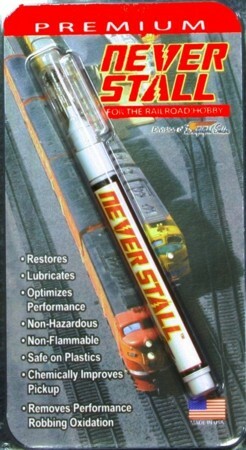 Developed for the railroad hobby, this new product will solve the problem we all face of locomotives stalling during operation. Neverstall is not a wheel or track cleaner. Rather, we have found that oxidation is the root cause of stalling when everything else looks like it should be fine. A little drop on the contact points, axles or the wipers on your wheel sets cleans oxidation and will make your engine run better than new. Once applied, Neverstall will work for months! Plastic friendly and made in America, the 6 ml tube is enough for a club or large layout.